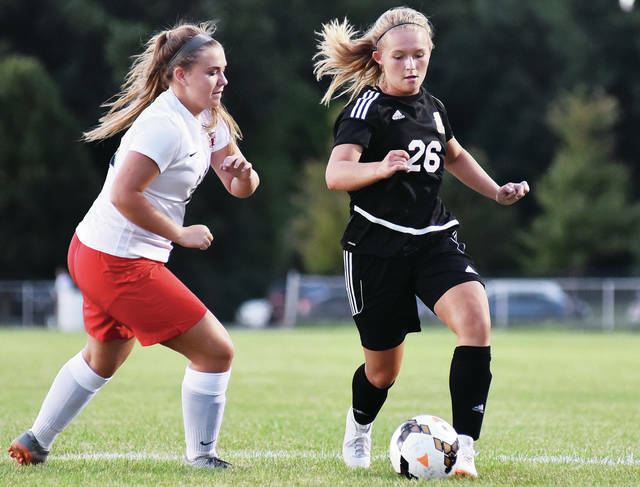 Sidney’s Elaine Wiesenmayer chases Bellefontaine players during a nonconference game on Wednesday in Sidney. Sidney's Khia McMillen keeps ahead of Bellefontaine's Erin Jackson during a nonconference game on Wednesday in Sidney. Sidney’s Khia McMillen keeps ahead of Bellefontaine’s Amy Lonsway during a nonconference game on Wednesday in Sidney. Sidney's Elaine Wiesenmayer dribbles during a nonconference game against Bellefontaine on Wednesday in Sidney. Sidney’s Trey Werntz hits during a match against Piqua on Wednesday at Shelby Oaks Golf Club. Werntz led the Yellow Jackets with a 44. 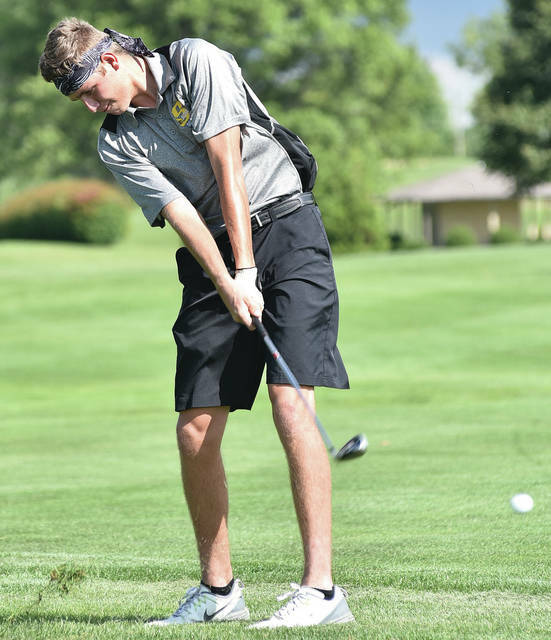 SIDNEY — Wednesday was a successful night for Sidney in the Piqua vs. Sidney all-sports trophy competition, as both the boys golf and cross country squads picked up wins. The Yellow Jackets’ boys golf squad beat Piqua 183-198 at Shelby Oaks Golf Club. Trey Werntz led Sidney with a 44, while Will Klepinger and Ben Spangler each shot a 46 and Brandan Rose shot a 47. “I was really proud of the boys tonight, especially Will,” Sidney coach Bill Rippey said. “Will had his best round ever at the varsity level. He has put in so much time and it really shows. I am extremely proud of him. The all-sports trophy winner is tabulated by a points system. In sports where Piqua and Sidney teams play once a season, one point is awarded. In sports where teams play twice (like golf), .5 points are awarded. After Wednesday’s events, Sidney has a 2-1.5 lead over the Indians. The boys golf squads will face off at Echo Hills in Piqua on Sept. 13. The Yellow Jackets and Indians split a cross country meet on Wednesday at Piqua High School. Wednesday’s race was a one-mile run. Sidney boys finished first with 23 points, while Piqua was second with 32. Piqua’s girls finished first with 22 points while Sidney was second with 35. Gavin Bockrath won the boys race in 4:58. Eli Straman finished third (5:06.6), Ian Bonifas finished fourth (5:07), Noah Schwepe was seventh (5:35.1) and Grant Hoying was eighth (5:35.4). Mariana Kellner was third in the girls race in 6:31. Montana Stephens was fifth (6:40), Sage Steinke was sixth (7:00), Nicole Siegel was 10th (7:12) and Maya Thompson was 13th (7:19). The Yellow Jackets earned another lopsided win to improve to 4-0 on the season. 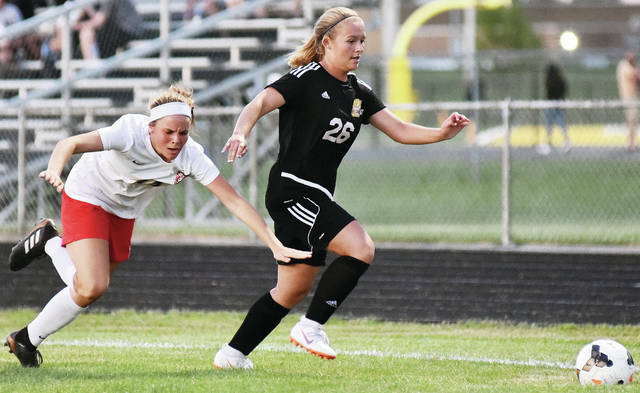 The Yellow Jackets scored six goals in the second half to run away to a nonconference victory over the Chieftains on Wednesday in Sidney. 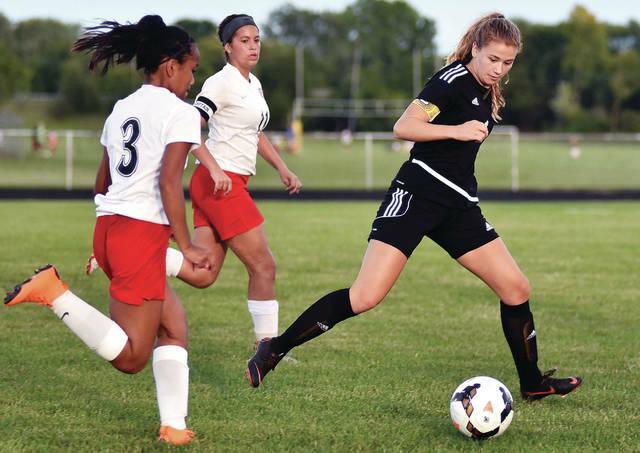 Elaine Wiesenmayer scored four goals while Khia McMillen and Jadah McMillen each scored two. Khia McMillen had two assists while Jadah McMillen had one. Morgan Heckler had three assists. Sophomore goalkeeper MaKayla Hurey had seven saves in her third shutout of the season. 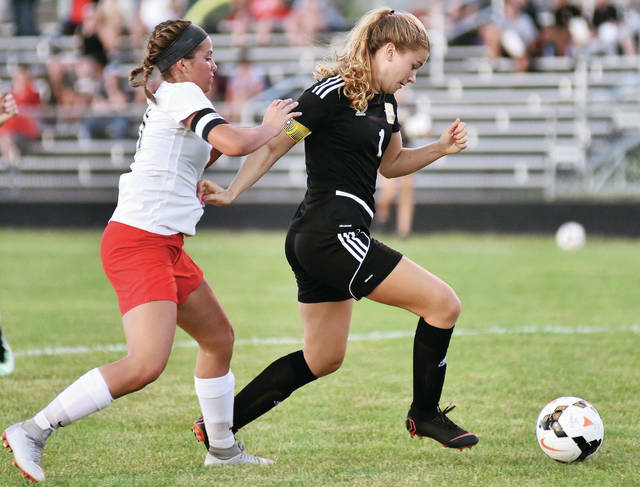 Sidney’s Khia McMillen keeps ahead of Bellefontaine’s Erin Jackson during a nonconference game on Wednesday in Sidney. Sidney’s Elaine Wiesenmayer dribbles during a nonconference game against Bellefontaine on Wednesday in Sidney. This entry was tagged all-sports, all-sports trophy, all-sports trophy competition, Ben Spangler, Bill Rippey, boys golf, Brandan Rose, competition, cross country, Elaine Wiesenmayer, Eli Straman, Gavin Bockrath, girls soccer, golf, Grant Hoying, Ian Bonifas, Indians, Jadah McMillen, Khia McMillen, Mariana Kellner, Maya Thompson, Montana Stephens, Morgan Heckler, Nicole Siegel, Noah Schwepe, Piqua, Sage Steinke, Sidney, Trey Werntz, Will Kelpinger, Yellow Jackets. Bookmark the permalink.